Ruined fork top thread! What should I do?? Tried to remove this stuck stem on an old motobecane, so loosened the fork's top bolt (not big on terminology sorry) eventually managed to yank it out but when putting the stem back I realised the bolt wasn't going back in prob due to this now revealed messed up thread. Is the fork ruined? The fork doesn't feel loos probably all stuck inside anyway. What should I do now?? First, take it to your LBS and have them chase the threads. If that works, consider yourself lucky as it shouldn't cost much more than $10-$20. If that doesn't work, you will need to rebuild the steel. Take the fork out of the frame. Wrap a wet cloth around the fork crown. This is to prevent too much heat weeping any braze joint. Next, use a tig welder to build up the steel. Use a file to remove excess weld. Retap the threads. My guess if you pay someone, it would be $100-$300, depending. I'd buy a new fork. Actually, you might luck out here. I notice that you still have the upper cone threaded onto the fork. That upper cone is threaded and already engaged in the threads. Were I you, I would take a small triangle smooth file (a 6" one would be best) and try to clean up the damaged threads with the file. Next, attempt to thread the top cone off of the steering stem. That just might clean up the threads enough to make them useable again. 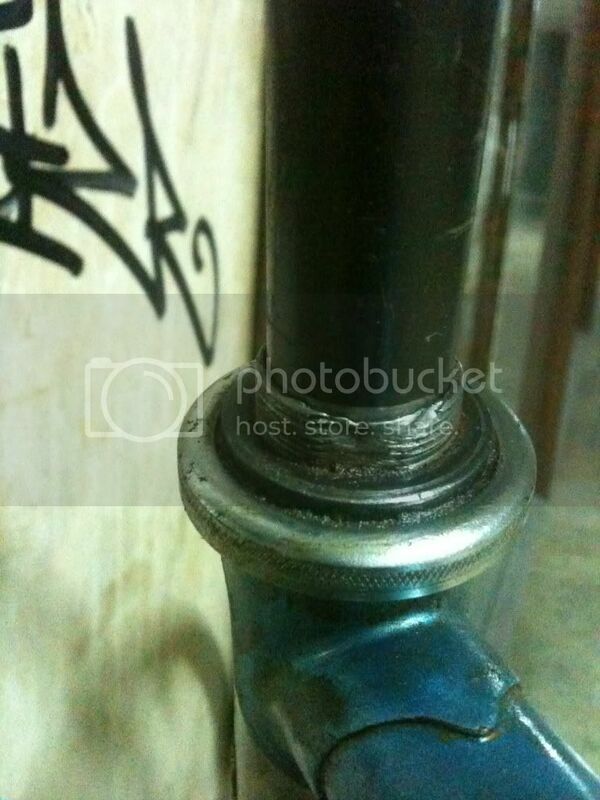 As for the inside diameter of the steering tube, just try to clean it up with a file. With a bit of luck, you will get away with this repair, even though it is not the proper way to do things. I'll check out the lbs, hope they do it, is that something quite standard for a good bs to do? If not I'll try randys advise. Stuck seat posts, and steering stems, can be a real pain. Exercise caution when attempting to remove either. If one or the other is really stuck, I cut them out, carefully. I prefer doing that to ruining another frame set, as I did once using the strong arm method of twist and turn. Ruined a set of forks once, also. actually I think that's exactly the proper way to do things in this case. You see that some of the "messed up threads" are just the flat that's milled into the backside of the steerer, the real bad threads are just the 2 or three at the very top end. I bet once you get the washer off and unscrew the top cone/race (might need a padded Big Channelock Wrench for that) some of those threads will get much better. But, wouldn't hurt to dress them a little first and for that I'd use a thread file (and you want a metric model with 1.0mm side), that's a nice tool to have and pretty cheap too. Most of the thread is still intact; only the part adjacent to the keyway is damaged. I'd use brass instead of steel to build up the damaged area, then cut new threads into the brass. Good point. I'm a welder, not a brazer. Then there is the old saying about every problem lookd like a nail. I have used these in low to moderate load situations and they work fine. People are complicating the issue with thread files (great tools, yes) and thread chasers (more good stuff). But the OP needs neither. A small three corner file and the bearing cone will clean the threads up just fine, in my opinion. And, it costs nothing to try my method. And, you have to take the bearing cone off anyway, to effect repair. Why not just try it. I would and I would be done already. I'm with Randy. It's worth a try to clean things up the best you can and try to back that bearing cone off. Remember to squirt some oil on the threads first, and take it slow - when the turning gets tough, screw it back down, clean out any shards, apply more oil, repeat, etc. I beleive I had one worse than that recently (Woodrup). It was not as gnarled, but a lot of thread was broken down one side. The frame maker chased it out. It looked remarkable after he had finished. Now the bike has a new Tange Passage headset. No foreseeable problems. Randy's idea could work too. Work the cone up back and forth like a die using oil. But a chase tool will IMHO cut or dress the threads the best after you get the part off. BHOFM's $4 tool looks interesting too. Last edited by Lenton58; 12-05-11 at 09:59 AM. Just to complicate things a little, being an old Moto, it probably has french threads. Not an easy to find die. OTOH, I see this frequently on old french forks, the spacer gets turned on the flat buggering the upper threads. Randy's suggestion of cleaning it up with a needle file and and running the upper cone over the damaged area usually works. Problem solved! Had the threads raced and everything was snugly screwed back! So happy. The guy even had the stubern stem released (pic) shame bout the colour but the bike is sweet now. What other methods were attempted prior to going to the mildly destructive method? I've had 1 seat post that I couldn't remove, it sheared off at the seat post clamp. Every other one has come out, after excercising some patience. Everything in the book... Hot water, penetrating oil, a bar through the one piece saddle clamp, several people trying to twist the saddle... The dude said I was lucky the post didn't snap in the frame. He said corrosion can be so stiff it can easily do that and harsh force can cause damage to the frame that's far worse than the colour melting. Found a pretty similar paint (p1991) and will retouch that area next week. But you need someone experienced to do that. He didn't use any force yanking it out, just heated it and gently started twisting the frame till the thing slid out. 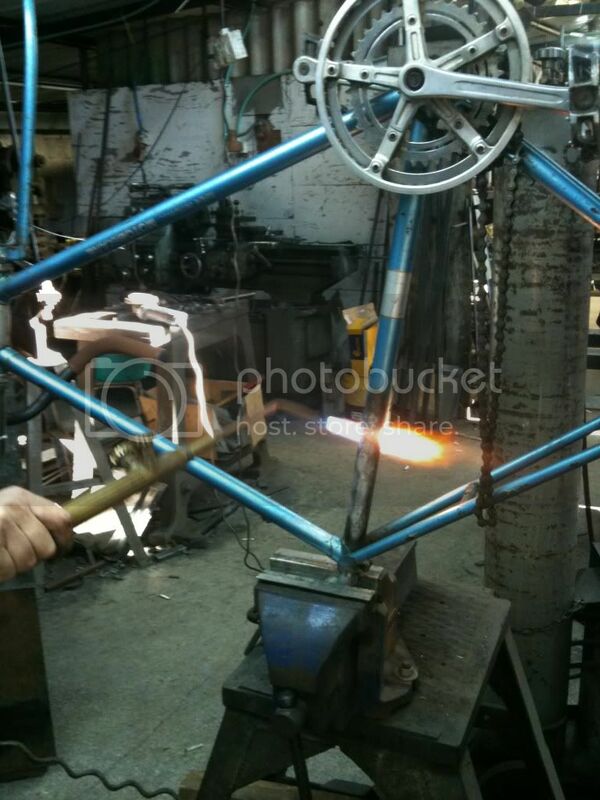 Is there any concern about the brazing material at the seat lug being compromised? No as long as yr careful not to over heat it. Plus the area you really need to work is a bit down from the lug. No. Assuming an aluminum post, the post will melt completely long before the brass starts to liquefy. Suggestions? Components For Vitus 992 Build, Where To Find?